The House Oversight and Government Reform Committee started looking at a bill that seeks to reduce the federal workforce through attrition by 10 percent by 2015. National Journal reports that the sponsor of the bill, Republican Rep. Mick Mulvaney (R-SC), estimates the legislation would save $139 billion over the next decade. The measure calls for hiring one federal employee to replace every three workers who retire or leave their job. Meanwhile, the director of the Office of Management and Budget said its time to stop beating up on feds. Jacob Lew, speaking at a Politico event this week, also told feds that they shouldn’t take it personally if you don’t get a pay raise soon. The Washington Post reports that it is too early to say if federal employees will see a pay raise in fiscal 2013 — of course, feds have seen two years of pay freezes. And before we move on from people issues… it’s the first Friday of the month so a quick assessment of how the Thrift Savings Plan accounts performed. And October was a good month for most of the TSP funds — positive numbers across the board. 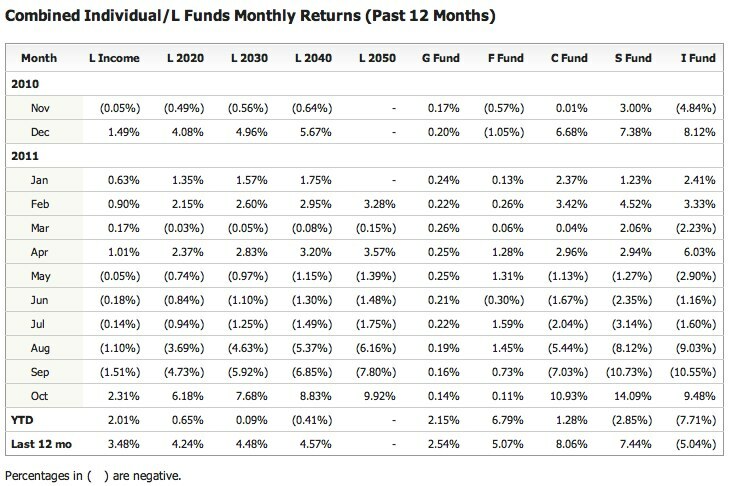 For the year, all funds are in positive territory except for the S-fund, the I fund made up of international stocks, and the L2040 fund. And we’ll talk about more money — specifically the budget — just ahead. OFPPs changing of the guard: The big procurement story of the week: The Obama administration’s procurement chief is stepping down. OMB announced this week that Dan Gordon, who has led the Office of Federal Procurement Policy for nearly three years, is leaving. He will become the associate dean for government contracts law at George Washington University Law School. Dan Gordon has been a forceful advocate for the procurement workforce during his tenure and he leaves big shoes to fill. But the GovLoop Insights Issue of the Week… well, the budget, of course. The Senate this week approved must-do legislation to fund the day-to-day budgets of five Cabinet agencies, kick-starting long overdue work to add the details to budget limits agreed to by President Barack Obama and congressional Republicans this summer. The vote sets up negotiations with the GOP-controlled House on final legislation that could be presented to the president before Thanksgiving. Hanging over the work on fiscal 2012 is the budget supercommittee, which must make its recommendations in just a few weeks. All of this is has an enormous impact on how the government operates. Ray Bjorklund, chief knowledge officer for Deltek. I got to moderate a panel this week with Ray as well as Richard Spires, the chief information officer for the Department of Homeland Security and Dave Wennergren, the Defense Department’s deputy chief management officer. The consensus coming out of that session is that these are difficult times but that there are some real opportunities — if people choose to step up to those opportunities. And that brings us to the GovLoop Insights Question of the Week: Does the government take the deficit seriously?